One of the largest sculpture exhibitions in the region, Shoreline’s ARTSCAPE and the pioneering Shoreline piano art project now widely imitated, PIANO TIME, open together in tandem with LOST DOCUMENTS, an indoor exhibition in the Shoreline City Hall art gallery. Arts al Fresco is the largest event that the City’s Public Art program puts on each year and features a performance at City Hall by Creative Music Adventures (singer-songwriter American roots music, featuring Michael Stegner and Friends) on Thursday, August 6, from 6:00 to 8:00 p.m. at Shoreline City Hall and the Park at Town Center. 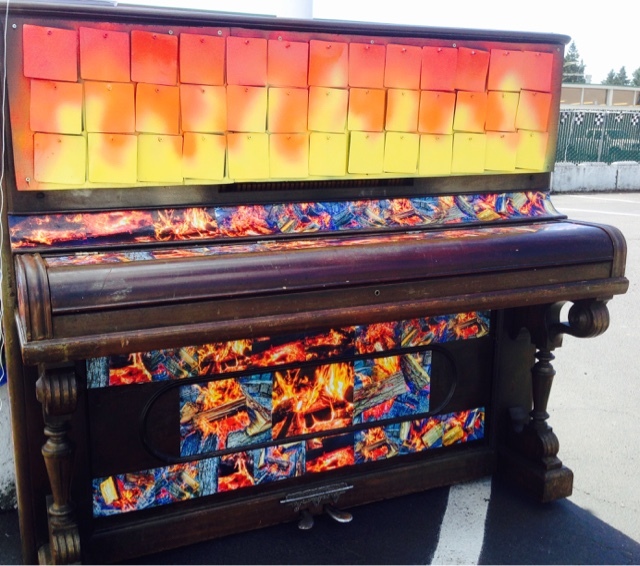 Maps of ARTSCAPE, PIANO TIME 2015, as well as the City’s entire current collection of public art will be available by August 6 on the public art page. The 12 artist-pianos will be on display through September 15; the Gallery exhibition LOST DOCUMENTS is up through October 23rd and the ARTSCAPE sculptures will be in place until July 2016. For more information about public art in Shoreline visit the public art page or contact Public Art Coordinator David Francis at (206) 801-2661 or dfrancis@shorelinewa.gov. Installation by ArtSite, Ltd. Seattle. Piano Time Project support from Prosser Piano, Harlan Glotzer, and Iora Primary Care. Shoreline’s Public Art Program is a part of Shoreline Parks, Recreation, and Cultural Services. Shoreline Lake Forest Park Arts Council partners with the City to manage the exhibitions at City Hall.